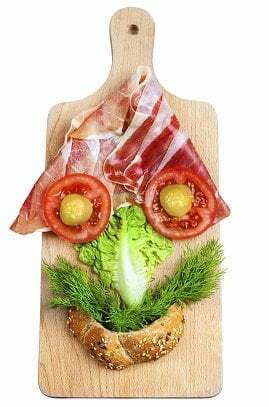 Need some kids' lunch ideas? We've got some tasty options. Quick and easy lunch ideas we guarantee your kids will love. You could be driven insane by fussy children and what they will and won’t eat for lunch. Do all kids change their preferences so suddenly and as dramatically as mine do? It seems like as soon I come up with a few lunch ideas that they love and that are healthy, and then go to the trouble of stocking up on ham, cheese, tomatoes, their favourite-shaped pasta and their favourite bread, they suddenly declare that they don’t like particular food items anymore. So I give them my “there are starving children who’ve never even eaten a cucumber before…” speech and they roll their eyes. Well, the older kids roll their eyes. My five-year-old daughter Caterina tries to roll her eyes, copying her brother’s bad example, but ends up sort of looking to the ceiling instead, which conveys her frustration more effectively than the boys and their eye rolls. As much as I am tempted to let them starve and offer them a simple peeled carrot once they are suitably ravenous, I persevere with trying to entice them to eat healthy food. Here are my latest go-to lunches that tick all the boxes: healthy, enticing for kids, and that I can eat too. 1. Make your own face. My son is in kindergarten and he is the absolute fussiest eater in the world. He’s also incredibly stubborn. So while I’m not allowed to make a face out of food for him in his lunchbox, I have shown him how to do it himself at school. I put all the elements of a face in his lunchbox and then he assembles it, amidst much laughter from his friends, and then he eats some of it (hey, I’m not expecting miracles). Just as an FYI, you should know that this post is sponsored by Oliving by Hans. But all opinions expressed by the author are 100% authentic and written in their own words. Until the day two out of my three kids decided they didn’t like wrap bread anymore. So I started using lettuce instead and two out of three of them loved it. 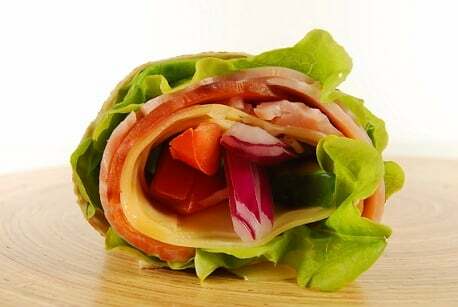 I wrap up all sorts of deli-meats (our favourites are from Oliving by Hans) and they eat it as long as it is wrapped in lettuce, preferably cos (the big, outer leaves work best). I just use lettuce and ham for the kids and add fancy fillings for myself. I love a good theme and Christmas gives you the perfect opportunity to Christmas-theme your children’s lunch. You can do this so easily by making their favourite sandwich as usual – the one they ask for but then don’t eat – and trust me, if it looks different they’ll eat it. I am doing stars at the moment for Christmas. For Halloween I used a goblin-shaped cookie cutter I bought. Suddenly those forgotten ham and cheese sandwiches and vegemite sandwiches are actually being eaten. And you are one of those mums who MAKES AN EFFORT. I’ve always wanted to be one and my giant cookie cutters make me one for a few minutes each week. 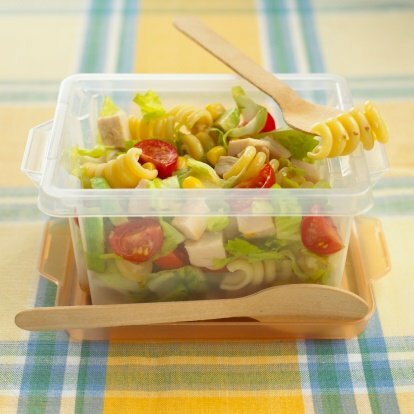 I used to pack pasta salad for my kids for school all the time but for some reason I forgot how much they used to love it. I think they just needed a break from it. But now, pasta salad has returned…with a vengeance. Buy every shape pasta you know your kids love and cook it the night before. Philip likes the little shells, Giovanni is an elbows man and Caterina really likes those Hello Kitty pasta shapes you can buy, but she’ll eat shells and elbows as well. Then, in the morning, chop up your children’s favourite deli meat…Philip likes salami at the moment, Giovanni eats ham only and Caterina eats salami, ham and the chicken slices. Then add the vegetable you know they like. Philip likes peas because they sit inside the shells sometimes, Giovanni doesn’t like vegetables so he just has the pasta and the ham and Caterina eats peas, zucchini, even cucumber cubes. She’s my favourite child. 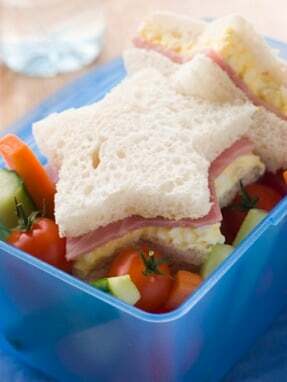 What are some other quick, easy and healthy kid’s lunch ideas?